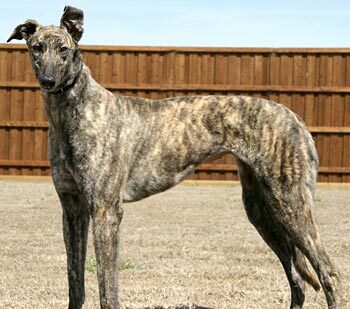 Shadow is a 1½-year-old brindle female born November 5, 2008. Her sire is Flying Hydrogen and her dam is Algoa Choo Choo. As the “D” pup in the litter, Shadow was not individually registered with the National Greyhound Association. 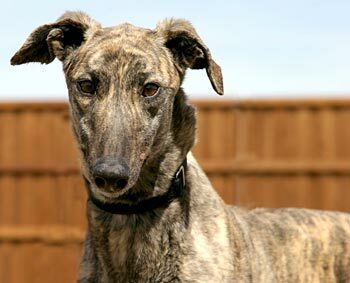 Shadow arrived with 2 other greyhounds – Angel and Ray – on March 3, 2010, from a coyote hunter in Amarillo. Fortunately for her, her only injury was a broken toe, unlike Angel who suffered from a large open shoulder wound. Shadow is big for a female, and she is happy as can be! Shadow is cat tolerant.